Seahawks cornerback Richard Sherman grew unhappy enough with a line of questioning from local talk show host Jim Moore that as he left the stage after his press conference Tuesday he said he could "ruin'' Moore's career. Richard Sherman’s weekly meeting with the media Tuesday — his first since his on-field tirade directed at coaches for a play call in Thursday’s 24-3 win over the Rams — grew contentious at its conclusion when he said he could ruin the career of talk show host Jim Moore of 710 ESPN Seattle. Sherman, however, later took to Twitter to apologize for his statements to Moore. The incident began when Moore, a co-host on the Danny, Dave and Moore show on ESPN 710 Seattle — the team’s flagship radio station — asked Sherman near the end of Sherman’s press conference about Sherman’s criticism of a play call by Seahawks offensive coordinator Darrell Bevell (Sherman grew upset during the third quarter of Thursday’s game after a pass from Russell Wilson to Jimmy Graham from the 1-yard-momentarily appeared to have been intercepted). Moore asked a question of Sherman stating that what he didn’t understand is that Bevell is trying to call plays he thinks will work but that Sherman appears to think he has a “better handle’’ of what should be called. The press conference ended a few minutes later. 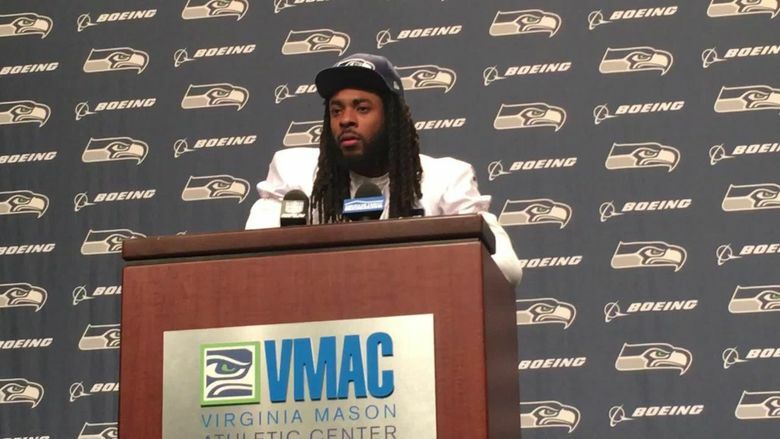 After practice Tuesday, Sherman took to Twitter to apologize. Sherman then Tweeted that #Petesaididontcontrolcredentials a joking reference to coach Pete Carroll apparently informing Sherman that it’s up to others to decide which media get to cover games.